Your wedding will look like a million bucks. Maybe even better! Okay, we admit our AMS team gets pretty excited about our uplighting packages. Here’s why: Our LED uplighting will decorate your hall according to your tastes. Your color patterns are used. 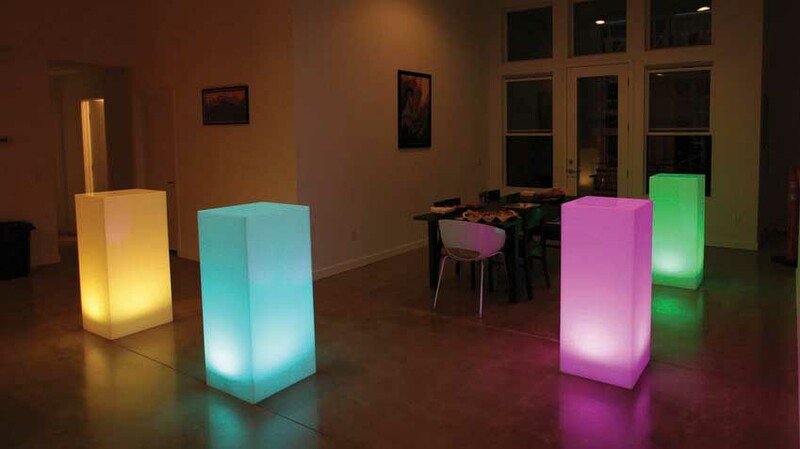 Lighting intensity is fine-tuned to create the soft, romantic feel that fits your personality. And then it can be modulated to create energy, or romance, or whatever mood your celebration calls for. AMS totally customizes lighting design to make your event uniquely you. Your venue will be simply beautiful. Yes, your guests will be wowed. Even more, so will you. Here’s the best part: uplighting is so affordable, less than one percent of an average wedding budget. You can afford a million dollar venue! Illuminated cocktail tables add a modern touch to your venue, creating sleek and inviting spaces. Definitely an impressive look for any occasion!